This article will help you in setting up email signature in Squirrelmail. Please be guided by the instructions below. Login to your Webmail dashboard and choose the Squirrelmail option. From the Squirrelmail dashboard, click on the Options setting from the upper menu bar on the screen. This brings you to the Squirrelmail Options screen. Click on the Personal Information link to continue on to the next page. From the Personal Information page, you can now insert your new signature at the Signature field. Also, be certain to select the checkbox named Use Signature located under Signature Options at the bottom of the page. 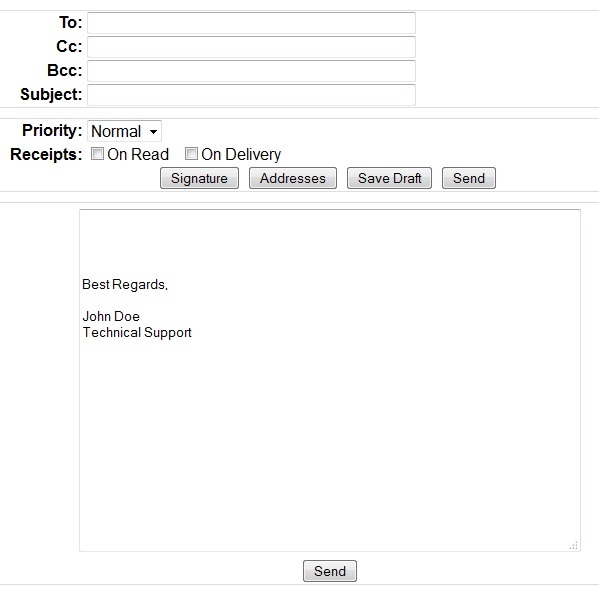 Click the Submit button found in the lower right corner of the screen to save the signature changes.Below is a screenshot of how your signature will display when creating a new email. Congratulations, now you know how to create an email signature in Squirrelmail!